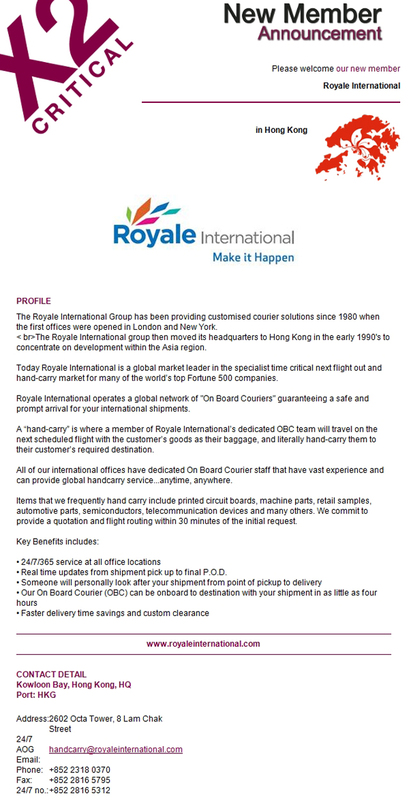 The Royale International Group has been providing leading quality, customised courier solutions since 1980. As one of the market leaders in Time Critical services across the global markets, we are also a member of the X2 Critical Network for Hong Kong. We are proud to also announce we have expanded our membership with the X2 Critical Network to include China, Japan, Korea and Taiwan. Since the development of our group in the 1980s, we have striven to guarantee the safety & promptness on our On Board Courier (OBC), Next flight Out (NFO) and Hand-carry delivery services to our clients. Our professional OBC teams are committed to serve 24/7/365, with promises to provide a flight solution with quotation to clients within 30mins. Upon confirmation & documentation clearance; clients could enjoy the benefit of real-time tracking and update, as well as a personal supervision of shipment from the pick-up point to the arrival of destination. We have a comprehensive network of offices on every continents, and we are always here to deliver. Shenzhen, China (Friday, December, 2013) – The Royale International Group is proud to announced the opening of a new eight story warehouse operation in Shenzhen, China. Located close to its operations in the Shenzhen office, the Royale Logistic Center will be served as one of the major hub for its courier, warehousing and operation business in Asia Pacific and china market. It provides up to 2,400 square meter of space for the expansion of storage and daily operations. “We are very excited to be starting the new 2014 with our new warehouse addition. The new Royale Logistic Center is a big step on the growth our warehouse management & logistics services. Royale International’s continued growth has made it necessary to build a larger warehouse to meet the increasing supply demands of our customers. The new warehouse combined with our new integrated warehouse management system (WMS) will benefit our china customers through the increase logistical and operational efficiencies and customize logistic solutions. ” said Spencer Lam, Director of China Market. Follow the twists and turns of the season as the Royale International Legal League, Royale International Champions League and Royale International Sevens Invitational campaigns unfold! The 2012 London Olympics commence on July 27th and run through until August 12th. During this period multiple road closures, vehicle restrictions and traffic limitations are being strictly enforced across the city. This will result in delays to London deliveries and collections during this period. For the third successive year, the Royale Intl Group is proud to announce that it is once again teaming up with Nottingham Forest FC for the upcoming Soccer 7’s event this coming weekend at the Hong Kong Football Club.The Nottingham Forest Mobsters are a mixture of former Forest stars and players from the Royale office team, the HKDC Mobsters, who play in the First Division of the Yau Yee League. Some of the ex-Forest regulars who have appeared for the team in previous Soccer Sevens include Nigel Jemson, Peter Davenport, Jason Lee, Des Lyttle and Darren Wassall. The team, who aim to replicate the beautiful passing game so synonymous with the great Nottingham Forest sides managed by the legendary Brian Clough, are looking to improve on last year’s performance, when they lost narrowly in the Cup quarter-finals to HKFC Veterans. We wish the guys every success! For more information, click on to the HK Soccer Seven’s website. The Royale International Group, one of Asia Pacific’s largest independent couriers, is happily supporting the King George V School this Christmas with the delivery and transportion support for their Christmas Carol and Fair project. The KGV Christmas Carols and Fair event is designed to support primarily the ‘School Development Fund’ and student supported charities such as raising money for the Mercy House Orphanage in Hua Hin, Thailand. This year the school successfully raised enough funds to aid the completion of the kitchen area at the Mercy House Orphanage. To learn more about the project and how you can get involved through donations, please visit http://alumni.kgv.edu.hk/. Member of the Royale International Group is bursting with enthusiasm as they prepare to take part in one of Hong Kong’s most exciting enduring competition on Friday, 21st Oct 2011. They are expecting to join among the hundreds of community members in this year’s Moontrekker event (www.moontrekker.com). The event is a part of a fundraising drive to help raise for the charity Room to Read (www.roomtoread.org). This involves a grueling 40km race over the mountains of Lantau in the dark with the goal of finishing before sunrise. Mr. Phil Murton and Mr. Michael Charlwood are hoping to complete the race around 8 hours time. “This will prove to be quite a physical and mental challenge for us and we are looking forward to raise as much as possible for this worthy cause”, said Phil. If anyone would like to donate, please contact phil.murton@royaleasia.com. Thanks in advance for your support.